The movie that further enhanced Salman’s super stardom consequentially got remade in few other regional languages and was declared a Dabangg hit everywhere. The latest to join the remake brigade is the Telugu version of Dabangg, oddly named as ‘Gabbar Singh‘. While Pawan Kalyan plays the Dabangg cop, the movie is directed by debutante Harish Shankar. The young Venkatratnam Naidu (Puri Akash) has troubles too many. He lost his father. He feels he almost lost his mother as she remarries. His step father pampers his step brother a bit too much and his mother supports their acts. On one rebellious morning, Venkatratnam Naidu changes his name to Gabbar Singh. Why? Cos he believes villains are greater and righteous than heroes, and the name Gabbar Singh of course is an epitome of villainy. And ever since he lives a life of his own, on his own Dabangg terms. Young lad grows into Pawan Kalyan, a maverick cop with right intentions. With time, a sort of awkwardness and enmity develops between Gabbar Singh and a local wannabe neta Sidappa Naidu (Abhimanyu Singh). Sidappa Naidu tries to traumatize Gabbar Singh in ways more than one. Pawan Kalyan delivered his trademark performance. 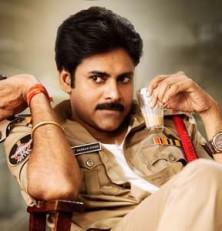 The director did a good job in molding Pawan’s character as a humor laced tough cop with hidden sentiments. Abhimanyu Singh was commendable in a negative role. Shruti Hassan as the lady love did her job aptly, and looked beautiful. Gayatri Rao’s character was a surprise and provides some entertainment. Ajay was okay, but couldn’t look as naive as it is required. Ali and Kota Srinivasa Rao were limited. Tanikella Bharani was almost perfect. Remakes today are more about copying frame to frame so to avoid any sort of risk. Director Harish has to be appreciated in this aspect as he molded the story to suit Telugu audiences and didn’t merely copy paste the original. The director has made substantial efforts to make it an out and out Pawan Kalyan movie. And his efforts worked well in pleasing Pawan’s fans who’ve been waiting since years for a blockbuster from the star. The movie is a commercial entertainer with punch dialogues, limited logic, and a larger than life hero. The larger than life image is acceptable here as that is what is expected from Pawan Kalyan. Though the movie is highly focused on humor and heroism, Gabbar Singh has the right mix of elements like action, sentiments, and romance. Technically, the movie scores well on cinematography and locations. The location of the initial fight scene was especially awesome. Devi Sri Prasad’s music was okay. I don’t find any recall value of the songs, but they were pictured very well. Screenplay was consistent in the first half, but slightly fluctuates later. Editing was good. Few punch dialogues work well. I must appreciate the action director – cos Gabbar Singh uses all kinds of weapons available at sight unlike others who drop weapons and fight with hands for no reason. The movie works because of entertainment, though mindless at times, and also provides a slight relief for Telugu audiences who’ve been getting to watch Tamil dubs or home made duds of late. For die hard fans, Gabbar Singh is a sure treat and the rest can watch it once. I’ll go with a 3 out of 5.